Phew… a lot later than intended, but have made it to my desk and am blogging for the second day in a row this week. Not wishing to make the blog sound like a shop window, but waxing lyrical about my amazing new projects is a difficult balance to achieve, so please humour me…. I had no weaving on the go, as pointed out by youngest son, so warped up the loom on Friday with a hand-dyed warp and matching hand spun and kettle-dyed in the same kettle weft from my stash which I dyed last year with the SpinDyeWeavers. I have called it Salmon and Sage, and to date have woefully neglected to get any pictures up on the page of it – it looks boring anyway as I haven’t got started on the weft weaving . I do know though from the top of my head, it was made with Landscape Dyes from Wingham Wool – so will fill in the blanks when I am near the paperwork. My next project though I am very excited about. 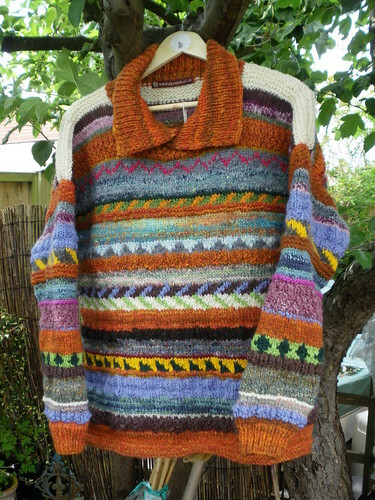 I tried to photograph it yesterday, but the weather was foul, so here is the link: Helena - Crochet Club Yarn June 2011. I have decided this yarn is too beautiful to do anything with except weave – as I want to savour and caress the colours and allow the fabric to twinkle at me, in a way which I don’t think it would if knitted or crocheted. I am always in a bit of a quandary here about telling you of recent club fibres and projects, as I hate that I might be a spoiler. That said I want to shout from the roof tops about Queenie Amanda’s Crotchet Motif Club. I love crotchet, but only vaguely remember it from my early youth, and I don’t feel very secure at all about following a pattern. With Queenie’s own designs, very simply and cleverly written, all my doubts are swept out of the window (well except the last line in the last motif, and then I can simply email here with my stupidity !!!!). If you need a bit more handholding, I am not the only one who has been bitten by this bug. Rosee Woodland, tutor and designer extraordinaire is holding classes in the area on the subject, and her website is full of good ideas for generally everything to do with craft, so would recommend it. I did tell you this post was a bit like a shop window, but I am still not making any excuses… I have just cast on Carman Shawlette – (had to pause in my blogging as I remembered I left it abandoned this morning when eldest daughter came unexpectedly to rescue us from our accumulated debris and detritus and assist in formulating a deep clean plan – this last month has left us reeling and our bodies are trying to catch up with our location!). I am knitting it with the beautiful wool I received in the May shipment of my Yarn Addict Fibre club… I have found a colour way similar here: Summer Blooms. It is described as Fairy Tale and it so is.. I must admit I struggle with shawl knitting, but am getting some inspiration and encouragement to try from the blog of The Sassy Spinner. I also saw some of her work up close at the recent exhibition, and it is really beautifully executed. I unfortunately struggle with memory and eyesight, but thought I would put my toe back in the water with this project, especially as it is annotated as easy. Managed to get lost this morning on the third repeat of Chart Pattern A, and inadvertently cast off some stitches before tracking down some markers and being a little bit more regimented about the pattern repeats. Finger’s crossed it won’t show – too much !! I do love though knitting her patterns as the charts – in theory are so easy… It really concerned me though that this was the kind of pattern I used to adore knitting so much, and now really struggle – hopefully it is just tiredness and sometime in the next year or two I will get myself back on track. What I particularly like about this particular club (the Not Just Socks Club) is you get to choose the pattern you want to go with the yarn supplied. This is perfect for me, as I would not want to have knitted a pair of socks from this fibre – unlike the Rose Socks which were knitted from the May shipment. Also I am not just stuck with the pattern given. Annie has published so many, it is difficult to choose from ! I am really pleased with the collar on this, and so hope she is as well !! Feel really guilty that it has been sat on my sofa for a few months now, whilst we have tried to find time to be “around”. 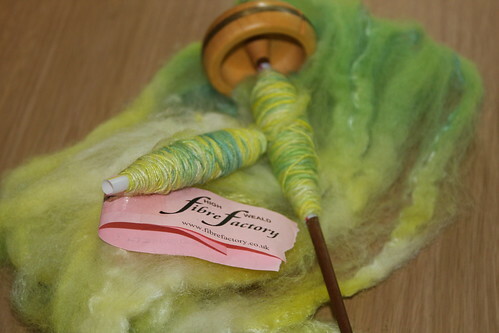 Really pleased with the drop spindling I have been doing – now becoming more by the mile than the yard as it is portable, and something to do when I am bored in the evenings when we are away from home. 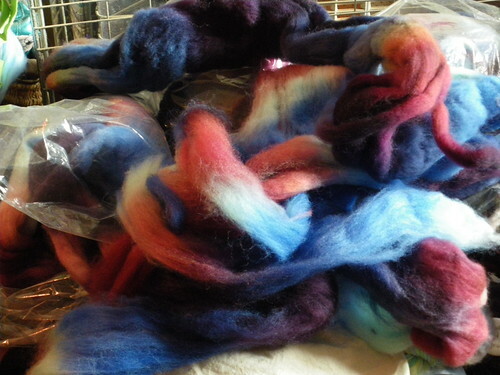 Spinning on my wheel the Volcano from Mandacrafts – detail on yesterday’s blog. Totally stalled here, so thought best go back to basics and worked on sorting out and cataloguing the books I actually do have, before haranguing the libraries and moaning at them about the books I think I want… Glad I did otherwise I would not have tracked down Debbie’s book, which was neatly filled on my bookshelf !! But when I got to 33 last night, I realised I had a serious problem…and clearing up seems light relief in comparison. Enjoy – see you all tomorrow…. My kettle dyeing is done predominantly at the moment with acid dyes, and no this does not make them more harmful to the environment than the similar natural dyes. All the processing of the dye powder has been done in the factory and disposed of ecologically – I have made sure of that, and therefore don’t use any dyes where I have any concerns about this. The acid I use as a catalyst (the equivalent job that a mordant undertakes in the natural dyeing process) to assist the dye to adhere to the fibre is usually common kitchen grade vinegar, but sometimes I use citric acid in crystal form.